I recently made the leap from iOS to Android and went with a Samsung Galaxy S7 Edge. I chose the Otterbox Defender for Samsung Galaxy S7 Edge to protect the phone. You just spent a truckload of money on this phone. Get a good case. Now. Keeping your phone safe is what the Otterbox Defender is all about. Don’t be lulled into thinking that your cell phone insurance is going to protect you from a large financial outlay to fix a broken phone as the deductibles are more than the Otterbox case. I was speaking to the salesman who sold me the phone. He told me the deductible is $150. I suspect that will vary by carrier. Practically every phone I have owned has been surrounded by an Otterbox Defender case. However I’m always looking for something better. I looked at two other brands of protective cases for my Samsung Galaxy S7 Edge. None came close to the protection offered by the Otterbox Defender for Samsung Galaxy S7 Edge. The Otterbox Defender is the toughest case that Otterbox offers. The Otterbox Defender for Samsung Galaxy S7 Edge consists of an inner hard shell case that surrounds your phone. The hard case has a built-in screen protector that is attached to the case. The back of the hard shell case has a thin foam pad which cushions the phone. An outer rubberized skin fits tightly over the hard shell case. That’s my Samsung Galaxy S7 Edge in an Otterbox Defender. Note the open flap at the bottom and the raised edges at the top and bottom as well as the side protectors. There are also cutouts on the front for access to the home button and speaker as well as camera. The fingerprint sensor is unaffected since it isn’t covered by the Otterbox screen protector. Unlike the case for my Apple iPhone 6s Plus, the Otterbox Defender for Samsung Galaxy S7 Edge does not have a protective surface to cover the home button. Thinking back to my almost year old iPhone 6s Plus Otterbox Defender, that’s ok. I found that protective surface is about ready to fall off and occasionally causes problems with fingerprint recognition. So I’m not going to miss it on the Otterbox Defender for Samsung Galaxy S7 Edge. Like all Otterbox Defender cases, this one comes with a holster. I don’t typically use the holster. It’s just too large a phone to comfortably hang from my belt. However, that’s just me and I see others that use the clip just fine. So how’s the case? Well, it’s the best of the three I checked out. An interesting comparison to the Otterbox Defender for Apple iPhone 6s Plus. The Otterbox Defender for Samsung Galaxy S7 Edge is not as bulky. The one for the iPhone 6s Plus turned that phone into a small brick. Not so much with the Galaxy S7 Edge. Ever try to use the Samsung Galaxy S7 Edge with your bare hand? I found it difficult. It was always slipping out of my hand. Even worse, the beveled edge design was setting off apps that I didn’t intend to launch. Introduction of a case, any case for that matter, makes a significant difference in usability. Unlike other cases, the Otterbox Defender for Samsung Galaxy S7 Edge includes an integrated screen protector. Based upon what I had read, this was a potential pitfall for the case because of reduced sensitivity. I remember a similar issue with early Otterbox Defender cases for the Apple iPhone 6s Plus. Eventually Otterbox made some minor design changes and made a great case. It looks like they did the same here. The integrated screen protector actually has a bezel design so it lines up nicely with the phone’s display. It wasn’t perfect. I downloaded an app from Google Play called Touchscreen Repair. This is a screen calibration app. It makes the screen more sensitive to touch. You touch four areas on the Samsung Galaxy S7 Edge repeatedly for the app to determine sensitivity adjustment requirements. Touchscreen Repair made a 7 millisecond adjustment and it improved things. I would say the sensitivity is a bit less than what I had on the iPhone 6s Plus case. The integrated screen protector works fairly well and I am able to interact with the keyboard just fine. This was a bit surprising to me hence the words used in the title. Based upon some of the reviews online, I was expecting some real problems. Perhaps Otterbox got it figured out and redesigned the current case which I was lucky enough to get. The flexible case seems to be somewhat stiff. A raised top and bottom will help protect the display in case of a drop onto a surface like a floor or concrete. Cutouts for power and headphone are molded into the case with flaps for added protection. A cutout on the back exposes the heart rate sensor and camera. Here’s a big surprise. The Otterbox Defender for Samsung Galaxy S7 Edge work with a Qi charger. Not sure if all the Qi chargers are the same but the one that I used was the Yootech Qi Wireless Charging Pad. The only exposure that I have concern with is the lack of a raised frame around the phone. Design limitations brought on by the bezel glass feature means the raised frame that would surround the phone was removed from the Otterbox Defender for Samsung Galaxy S7 Edge case. This leaves the potential, albeit limited for a freak drop on the edge of a table to hit the glass surface (which is protected by the screen protector). I can’t tell you the number of times I have dropped my phones over the years only to be saved by an Otterbox Defender. The rubberized skin, hard case and integrated screen protector form a protective barrier around the Samsung Galaxy S7 Edge that is a huge improvement. 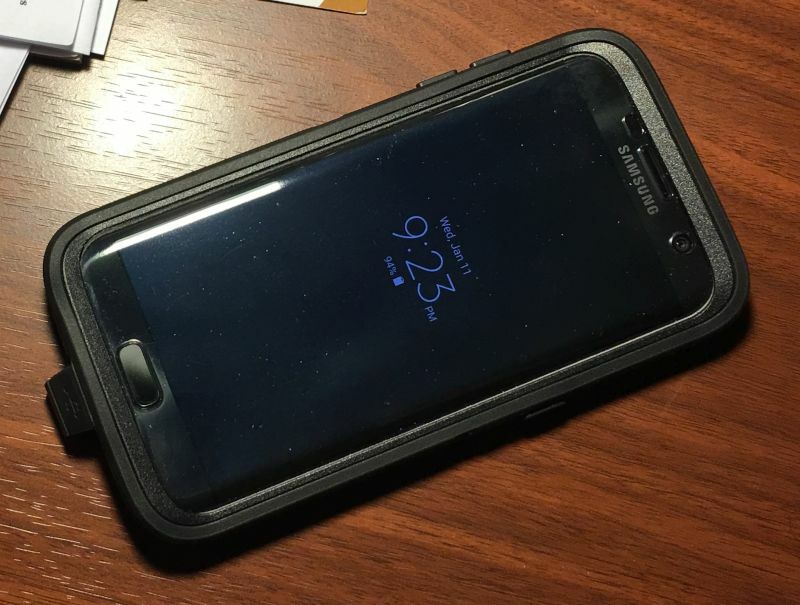 The Otterbox Defender for Samsung Galaxy S7 Edge makes a worthy addition to my new phone and provides added piece of mind in not having to worry about my phone accidentally dropping. Otterbox makes several different models for the Galaxy S7 Edge. If you’re an Otterbox fan but not sure which model is right for you, read our article on How to Select the Right Otterbox Case.